Index Next: Day 1: Travel. Location of the Jotunheim National Park. Now that I've been to Norway I wonder why I left it so long. It is a truly fantastic place and I will certainly be going back. For this first trip I chose the best known mountain area, the Jotunheim National Park. 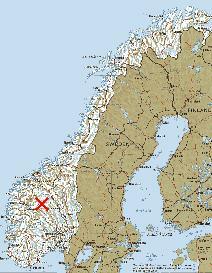 This area contains Norway's highest peaks and is more accessible than the more wild areas further North. Wild camping is allowed nearly anywhere in Norway and since I don't particularly like mountain huts I decided to make this a backpacking trip. In order to keep the weight of my rucsac to a minimum I invested in a very light sleeping bag (a Mountain Equipment Dewline, less than 700g) and a hooped gore-tex bivi bag "tent" (about 1200g). Along with cooking gear, clothes and other bits and pieces my bag weighed 13kg which even I can carry without much pain. To this I added 6kg of food which was more than enough to last the 9 days that I was backpacking for. 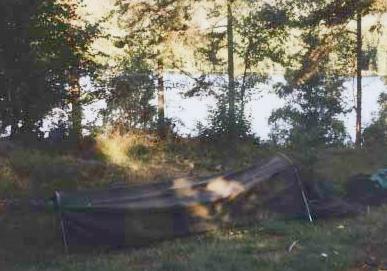 My mini-tent at the Sognvann park, Oslo.